(CNN) -- The United States has created a "zone of impunity" by rarely investigating private contractors involved in the unlawful killing of civilians in Afghanistan and Iraq, a U.N. human rights envoy said. 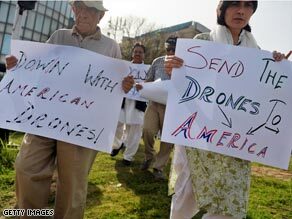 Civil rights activists protest the use of unmanned U.S. drones in Pakistan. The U.S. government should track the number of civilians killed in its military operations abroad and limit collateral damage from unmanned drone attacks, Special Investigator Philip Alston said in a stinging report submitted Wednesday to the U.N. Human Rights Council in Geneva, Switzerland. "The government has failed to effectively investigate and punish lower-ranking soldiers for such deaths, and has not held senior officers responsible," Alston said. "Worse, it has effectively created a zone of impunity for private contractors and civilian intelligence agents by only rarely investigating and prosecuting them." Alston recommended that the United States establish a national commission to independently look into the policies and practices that are leading to the deaths. He also urged that an independent special prosecutor be charged with pursuing criminal allegations against government officials accused of wrongdoing. "First, the government has failed to track and make public the number of civilian casualties, or the conditions under which deaths occurred," he said. "Second, the military justice system fails to provide ordinary people, including U.S. citizens and families of Iraqi and Afghan victims, basic information on the status of investigations into civilian casualties or prosecutions resulting therefrom." Alston called the United States' reliance on pilotless missile-carrying aircraft "increasingly common" and "deeply troubling." U.S. forces operating in Afghanistan have used drones to attack militant targets in Pakistan. Pakistan has said the attacks have claimed hundreds of civilian lives. Mark Cassayre, the American representative to the U.N. Human Rights Council, said U.S. military and intelligence operations during armed conflict did not fall within the special investigator's mandate. Alston is the special investigator on extrajudicial, summary or arbitrary executions. "We wish to be clear that the prosecution of private contractors who commit crimes is an important priority of the Department of Justice, and despite the difficulty of these cases, the United States continues to attempt to bring private contractor cases to justice," Cassayre said.